I have been struggling, truly struggling, with getting things done and figuring out what motivates and drives me to get things done. I once wrote in a private blog, “It’s a decision to do! Nothing more. Nothing less.” I went on to say that if I wanted to change my diet or drink more water, I didn’t have to throw out my junk food or rearrange my family’s diet – I just did it. It’s the decision. In those moments when I make the decision I feel unstoppable. Here’s the thing. There are times when I can’t make myself do stuff. I say I need to do something and then I go take a nap or I clean the house. I refuse to hold myself to the work. I struggle and more importantly I suffer. Nothing gets done and all of a sudden I hate myself. So I try something else. Maybe if I get someone to hold me accountable I can get myself to follow through. NOPE. That fails, too. It’s awful! The “have to” gets in my way. I start, but just fizzle and I fizzle quickly. And then, I Suffer. What the hell is wrong with me? I know I can motivate. I know I can do crazy things and be disciplined and drive and make things happen. Why can I do grand things sometimes and at other times I can’t make myself do stuff and other people can’t make me or inspire me either? Even being contrarian doesn’t work for me. If someone says “I bet you can’t!”, I shrug it off and don’t really care. DAMN IT! What will inspire me to “DO”? This has been my curse. I was listening to the Tim Ferriss podcast and he was interviewing Gretchen Rubin. Gretchen explained there are four tendencies that form out of the question, “How do I respond to expectations?” It turns out that this simple word, expectation, is THE player in what gets people to “DO”. I was interested but not overly so. Towards the end of the podcast Gretchen came back around to tendencies and asked Tim what he thought his tendency was. Tim is a Questioner and as they discussed the traits in detail I finally understood my husband! I was so excited, while I walked around the lake listening to the podcast, that I actually clapped my hands when they said something that totally explained who he was. I was blown away. I’ve never come across such an on point personality trait description. I had fallen down the rabbit hole! Sadly, the only tendency they didn’t discuss was the Rebel and I had a feeling I was one. So, as I often do, I Googled the Rebel tendency and downloaded the book on Audible. As I learned about the Rebel I started to become super excited to have this awareness of my tendency and at the same time I was terrified. This description of a Rebel from Gretchen’s book really rang true for me: “You can’t make me and neither can I”. What was I suppose to do with that? I told my husband about our tendencies, from my limited understanding, and his response to mine was, “wow, that sounds really childish.” My heart was broken and I told him so. He wasn’t attacking me but he was saying exactly what I tell myself in my head every time someone tells/asks me to do stuff. First, I react internally with “Well since you want me to, I won’t.” and then another part of me kicks in and says “That’s crazy, you sound like a 5 year old.” And the dissonance begins. My husband is so wise. As I listened to the Audible version of The Four Tendencies today that’s pretty much the lynch pin for a Rebel. I have to do it because I want to do it. It has to come from me, but in a way that is a want, not an internal expectation. If I expect myself to do something, I rebel against myself. I know it’s crazy, but it’s true. I could go on and on about this, but for now I want to learn more about how our reaction to expectations affects our actions. I believe this idea and the four tendencies Gretchen Rubin describes are a powerful framework for self understanding. To find out your tendency go to gretchenrubin.com. So once again, thank you Gretchen! You have no idea the clarity you have brought to my thoughts, feelings and daily life. I feel empowered and creative and I really owe it all to your understanding of expectations and the fact that you’ve shared it with the world. “You can’t spell rebel without the BE!” I love it! A Leap of faith? Regarding my decision to quit a job? Really? All I did was leave one career working for someone else to another one working for me. Not really a leap of faith in my mind. It could be a leap of faith for some, but for me it was financially feasible, and planned a year in advance. I must admit that it’s weird to be dependent on my spouse for support while I figure out my new trade, but the weirdness isn’t really worthy of a leap. It feels more like stepping into a new pair of shoes. So, now I’m thinking: what is a “leap of faith”? When have I made one? What did it feel like? And as I searched my past I realized I’ve made a couple, of what I would call, profound (capital L) Leaps. 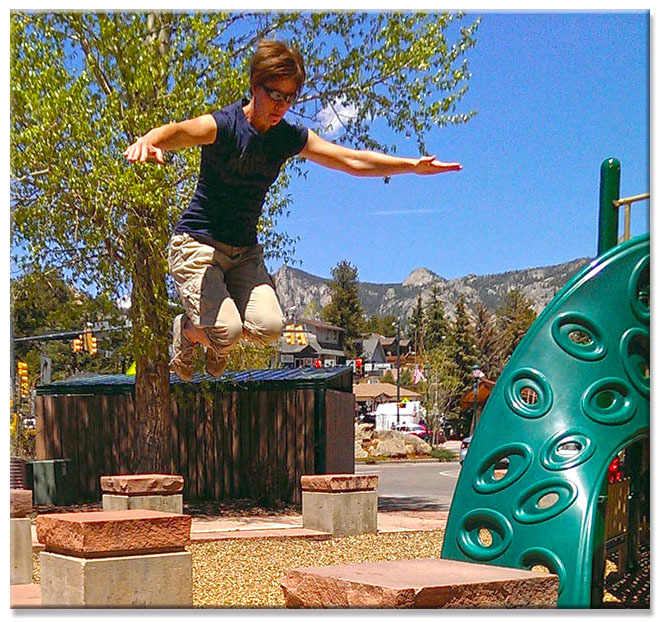 I also took a leap when I quit my job at the Longmont Chamber of Commerce. It was a stable job that supported my lifestyle, but it started to change me into a person I didn’t like. My outlook on life became one of bitter resentment and that’s not how I wanted to live. So, I honored my sense of integrity and loyalty, and gave a full months notice. I left that job with little in my savings account and nothing to fall back on. My most recent leap was when I joined the EGCM (Equine Gestalt Coaching Method developed by Melisa Pearce) program. It was a leap of faith for me because I didn’t go in with curiosity and an attitude of “maybe I’ll do this for a living and maybe it will be a new fun thing to do with the horses”. No, I found the program, did a bit of research and less then a month later I jumped in with one goal: To become a full time EGCM practitioner. No, if’s ands or buts about it! I was going to do the program in the 18 months, then quit my job and become an entrepreneur! But wait! Weren’t each of those actions a Leap of Faith? If Anthony Robbins is correct, and I think that he is, there is no way I could have made those changes and remain true to how I defined myself before each of them. I had to change my identity first. Changing my identity was the leap of faith! This realization brings clarity to the actions that were previously considered the leaps of faith. I can now see the old identity and the new one that replaced it, and below is a description of the shift that occurred in each case. With the man I was dating I had to let go of my Damsel identity that was so cautious about my choice of dates. I had to step out of the identity of a girl that dated a specific, in the box, finished package type of guy, and I had to move to an entirely different identity. The name that I feel fits this new identity is Gambler. I became someone who was willing to be open to dating and growing and if need be moving on. After my identity changed I was able to let go of the man I envisioned being with (finished package guy) and instead follow what I felt was inside this man: character, integrity and a good heart. This new me could date this man believing that we could grow in the same direction even if our paths separated at some point. Did I have to change my identity to date this man? No. Would the relationship have worked if I hadn’t? Probably not, because I would have tried to change him into what I wanted him to be and I would have tried to mold him to fit my Damsel identity, to be what I envisioned: that finished, total package. Instead I was able to enjoy the man he was as I stepped fully into my new Identity of Gambler. By being open I found a friend, a lover and a husband, and he found the space to eventually change his own identity a few times as well. The shift in beliefs, values, and rules I now held changed all my future decisions. Now we have been together for 12yrs and married for 6yrs. Needless to say I’m not disappointed with the way that Leap turned out. With my Chamber job I thought I was following freedom and independence, when in fact, I was living the Coward identity. I held on to the secure job and consistent paycheck regardless of the negative impact to my mind, body and spirit. I had to move from the Coward to a person of integrity who followed her personal truth. For me this new identity was that of the Seeker. I also realize that establishing my Gambler identity helped with this shift as it allowed me to trust taking a chance with change. Could I have left the chamber if I hadn’t made the shift in identity? No way! That “security” person needed her apartment, needed income and a title, and would live with resentment to keep it. Only when the Seeker took over and I became a person of truth and integrity did leaving the Chamber even become an option. That’s because my beliefs about myself and others had changed. The rules of the game were new and different. My beliefs changed regarding how someone is supposed to move through the world, and this allowed me to see roads and opportunities that I couldn’t see before. This leap of faith worked out really well, too. After leaving my job at the Chamber I found a career in IT that sustained me (rather well, I might add), for 8 1/2yrs. Interestingly, I wouldn’t have landed the IT position had I not previously shifted my identity to the Seeker. During the interview for a secretary position, I told the VP who was interviewing me that I would have to leave if a better job came along. I did this knowing full well my comment would likely cost me the job I was interviewing for. But I had to be honest. Surprisingly, instead of hiring me for the secretary job, they called me back to interview for an IT helpdesk position that paid more and offered much better potential for growth. By taking the leap of faith and moving into a new identity, I ended up with what the old Coward identity always craved. For the last 8 1/2yrs I have had the freedom to grow as a professional and I have more independence then ever financially, emotionally and physically. And most recently with EGCM, I changed from a Servant identity, which manifested itself as a life long employee, to the Magician, a person who has the vision and creative abilities to realize the work that I was always meant to do. Once again I don’t think I could have changed identities from Servant to Magician if I hadn’t already adopted the identities of the Seeker and the Gambler. The decisions since that shift have all been in line with these new identities. So after examining my personal leaps – what did I learn? I learned that it’s not how dangerous or scary the life change is, but the mindset behind it (i.e. what beliefs, values and rules are informing the decisions), which was created by my definition of self. Quitting my job was not a leap of faith. In fact, I was only able to quit my job because I had already taken the leap. In my case it was moving from an identity of Damsel, Coward and Servant to an identity of Gambler, Seeker, and Magician. The leap of faith is an act for sure, but more then that it’s the decision to become something new; to let go of an entire aspect of self and step fully into another one without ever looking back. Stepping up and deciding to be me was, and always has been, the leap of faith. Leaving my IT job was just the next step once I hit the other side.